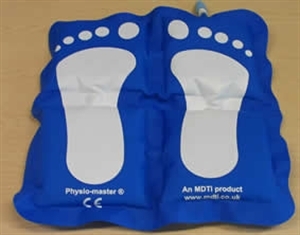 A unique self-inflating cushion, invented by an employee of The Shrewsbury and Telford Hospital NHS Trust. The Physio-Master vascular and balance cushion is a lightweight, portable, self inflating and easy to clean cushion. It has 4 cushioned pads, 2 pads for each foot and air can pass between the pads. It can be used both standing and seated. When seated, using a walking motion on the cushion increases venous return which benefits blood circulation. It can be used to increase circulation when leg and foot movement is restricted, for example, when flying. When used in a standing position the Physio-Master aids balance (proprioception/postural stability) and increases vascular return (circulation). It is a useful exercise tool where there is limited mobility and to encourage balance and postural stability in the prevention of falls. The PHYSIO-MASTER® promotes increased blood flow and venous return and so reduces the risk of blood clots or DVTs (Deep Vein Thrombosis). It can be used on long haul flights and journeys as well as in the office or at home when sitting for long periods. This product is available worldwide. Excluding Finland & Sweden.